High quality components, construction and finish. 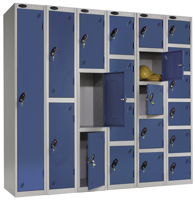 Probe lockers are a leading UK manufactured brand, they produce an extensive range of lockers for a wide variety of uses. Manufacturing standard personnel lockers along with personal effects, laundry management solutions, industrial lockers, laptop, tablet, and leisure lockers making just a small selection of the total range. All Probe lockers are finished with anti-bacterial coatings using Dupont Active Coat - resistant to MRSA, which is ideal for both Schools and Hospitals. 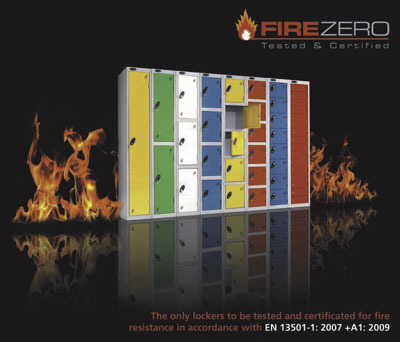 Probe powder-coated steel lockers have achieved the rare distinction of being the only locker range in the UK, if not Europe, to be tested and approved in line with the European Standard - EN 13501-1: 2007 +A1: 2009 relating to fire performance. Classified as ‘non-combustible’ they will not increase or sustain any fire within their proximity. Compliant with the requirements set out in Building Bulletin 100: Design for fire safety in schools. Each Probe Locker features as standard an integral air vent system*, a micro sprung disc lock, 5 knuckle hinges, welded front frame & internal door strengthens *. Available with many lock options, key and swivel hasp locks are the standard or for a premium: coin return, coin collect, mechanical combination locks, electrical combination locks and card access locks; there is also an option to have numbered wrist straps in a variety of colours for coin operated locks. If you need fire rated lockers as part of the locker specification or the lockers are in an area where it would be an advantage for the metal lockers have a fire rating then here is the solution. Take advantage of this ground breaking product development and make sure that your customers are aware that Probe Lockers are the best locker choice for use in educational buildings and public areas. Goods may be palletised and delivered on an articulated vehicle.